The little boy in the foreground above is Sandagdorj. He is pictured with his family. My wife and I have been sponsoring Sandagdorj since 2001 via World Vision Singapore. 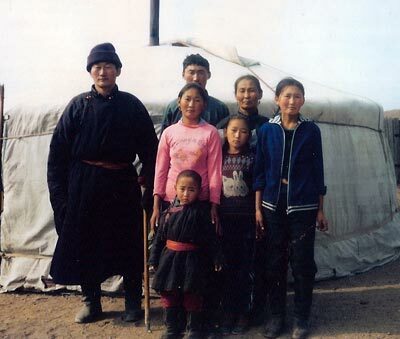 Sandagdorj lives in Mongolia and via our sponsorhsip we have assisted Sandagdorj with his education. His father is unable to work. We receive regular correspondence and updates from World Vision. The updates include notes and drawings from Sandagdorj and photographs as well. Shao Ping and I have watched Sandagdorj grow up during the last 7 years. I thought I would take the chance to share with my readers as part of Blog Action Day which this year is focused on poverty. You still have time to participate.